I’ve been looking forward to this new addition to Amish America for a long time. Various questions seem to recur on Amish topics. I thought it might be nice to put together a resource to try to answer some of those questions. 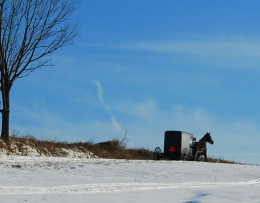 The Amish Online Encyclopedia (AOE) covers a variety of subjects including Amish culture, beliefs, the different Amish affiliations, occupations, education, transportation, and so on. After much work, we’re launching the AOE with 75 articles currently available. Topics covered include “Who are the Swiss Amish?“; “Do Amish vaccinate their children?“; “Where do Amish go shopping?“; “What are common Amish names?“; and “How are Amish communities organized?“. With more to come. Answers are based on academic research as well as Amish input. There’s a list of sources for more information at the end of each entry. You can search in 3 ways-alphabetically, by general topic, or by scrolling down the main index. I hope you find it useful. If so, please feel free to share the AOE with others. It’s the first of a few new additions planned to Amish America. Also, you also may notice the blog looks a bit different now. I am battling a bit with a new layout, and particularly if you are viewing this in Internet Explorer, you may notice a few design errors, ie, in the comments section. Hope to have those resolved soon. Thanks for the patience. I’m happy to hear your feedback on any and all of the above! What a great idea! I’m looking forward to using it often. I think this is a wonderful effort! I look forward to reading everything in this new online encyclopaedia. A new and awesome aspect for me and the rest of us to enjoy! I think, though, that the Global Anabaptist Mennonite Encyclopaedia (GAMEO) ought to be shared too, with the readers of Amish America. Or at least linked to as an equally well done resource. I guess everyone knows about that one. But for those that don’t…. I love the concept though. Please keep up the wonderful work!! Many thanks Shom, I am looking forward to adding to it. Hi Erik! I still think the new addition is wonderful! I admit I jumped the gun on the GAMEO link, I posted before I read about the New Orders and Beachy’s which has a GAMEO citation. Once again wonderful work on the whole thing!! As an Amish person I just want to say that I think Eriks AEO is a very respectful and thoughtful source of information. May I commend you on this addition Erik. This is a wonderful and informative site. I enjoying reading about my favorite amish areas and their ways of life. They say God’s country is everywhere, but when I’m in Holmes County, Ohio, I feel it very strongly there. I look forward to visiting this site daily. Good luck and God Bless.